When it comes to music Jacksonville, Florida is one of those cities that tends to fly under the radar. One of the greatest musicians of our time, Ray Charles, started his career in Jacksonville, with several others following suit. Today, Jacksonville’s local music scene is thriving more than ever and the spirits of the city’s late and great musicians live on. If you’re a music fan like me, you’ll be searching for homes for sale in Jacksonville after seeing how many great musicians got their start in this great city. “I miss the old Kim” is a statement that is lingering in the entertainment world especially by the 90s hip-hop lovers and they are not just referring to her catchy hooks and feisty punch lines, but also her appearance. Anyone that has a good vision can assume that she has had a bit of cosmetic work done on her face. However, some could say she’s barely recognizable. It’s rather unclear whether or not she has regrets about her drastic change in appearance, but it does seem to be a rather touchy subject for the Brooklyn rappers. The rapper, whose real name is Kimberly Denise Jones know has an unrecognizable face, that includes what appears to be a lighter skin, fuller cheekbones and a smaller nose. Her new look surfaced after several months reports stated that she had undergo a plastic surgery. When Kim was asked about the media’s fixation on her face during an interview with Rolling Out, in her replies she stated, no disrespect, no shade, but I’m not going to answer [that] question. Then she went on saying that she thinks that’s kinda corny and she doesn’t know how to answer that. “That’s not a question I would answer,” she continued. “I’m blessed. That’s all I can say and I am who I am.” Lil Kim was more willing to discuss her current thoughts about finding love with a possibility of getting married. She went along by saying if it happens, it happens and she is not going to fight it because at the end of the day she feels as if she can have both. 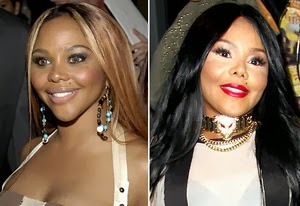 Do you think people should discontinue talking about Lil Kim’s appearance?